Aircraft operators using Oban as a base for their holiday can apply for a Holiday Voucher which offers temporary indemnity for up to 2 consecutive weeks. This is non-transferable and only available to non-commercial aircraft no greater than 2730kg MTWA, aircraft operators must present a valid copy of insurance prior to issue. From Easter 2014 a non-transferrable landing loyalty card offering aircraft a free fifth landing after 4 full price landings at Oban has been introduced, contact airport for further details and to request a card. The Council is prepared to consider requests for waiver of charges from a General Aviation (GA) pilot who makes a general safety-related diversionary landing. This waiver only applies to domestic GA traffic. The council reserves the right to opt out of the AOPA scheme at any time subject to three month's notice being given to AOPA by the council. 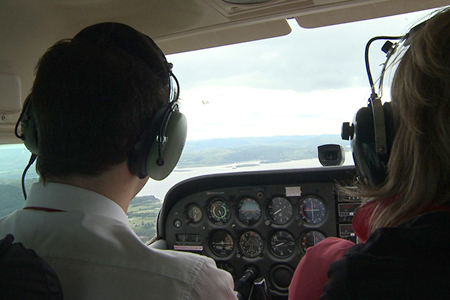 Eligibility for waiver will be based on the same criteria as for a light aircraft landing fee (i.e. private flight in accordance with Article 255 of the ANO 2009). The above rates are subject to a minimum charge equivalent to two hours. Note: a pre-arranged extension of up to one hour immediately following normal opening hours would incur a charge at 50% of the normal hourly rate i.e. £239.00 for Oban. Out of Hours Annual Indemnity Permit - £46.00 Available for non commercial aircraft no greater than 2730kg MTOW. A discount of 20% is offered on weekly aircraft parking permits. Applications may be made to the Station Manager at Oban airport, arrangements and payments must be made in advance of the aircraft parking fee arrangement period. Amount payable for each departing passenger on a Public Transport Flight over the age of two years old. Annual permits available on application from the Airport Manager. All vehicles proceeding airside must have the minimum level of insurance as specified by Argyll and Bute Council (details on request). Where an airport user damages airport property (for which the avoidance of doubt includes, but is not limited to, the runway, buildings, security barriers and fences) the Council shall have the right to recharge the user for any and all reasonable costs incurred by the Council. This includes, but is not limited to make good materials, vehicles, manpower, equipment etc., deemed necessary to make good the damage. Aircraft landing at or taking off out-with published operating hours without a valid indemnity permit (registered user certificate on Coll and Colonsay) or without prior arrangement with the aerodrome operator Argyll and Bute Council, c/o Oban Airport will be subject to a 6 month ban from all Argyll and Bute Council operated aerodromes and a £61 charge to be paid within one calendar month. If unpaid will be charged at £579 per month until settled fully. Any individual trespassing on the airport without approval of the aerodrome operator Argyll and Bute Council, c/o Oban Airport, including release of animals will be liable to a charge of £579. Both AVGAS 100LL and Jet A1 are available at Oban Airport, via Total Logistics Concepts (TLC) Ltd. To arrange refuelling, please contact TLC directly on 0777 062 0988.